Is the Cortez Method™ going to work for you? FIND OUT NOW! Please do not make the commitment to start our training program without FIRST reading this Training Guide! We don't want you to invest one penny in your training before you are sure this is for you. We have a training guide with the secret to the success of our methodology that will IMMEDIATELY let you know what we are about. Furthermore, you will be able to use it immediately. 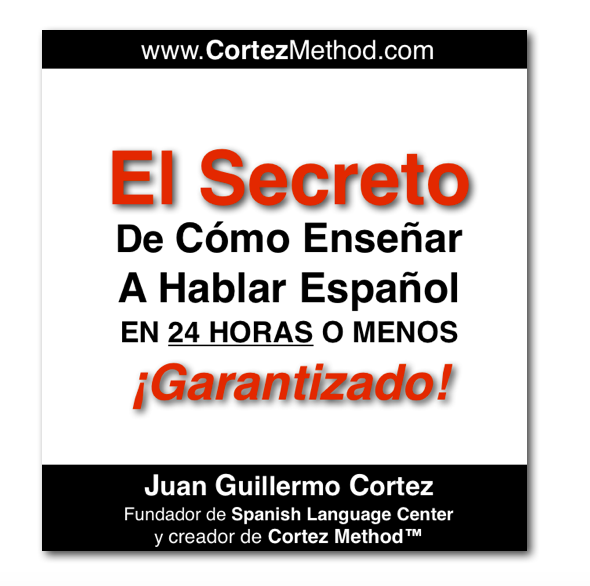 You will quickly acquire our secret that we use to teach our students to speak Spanish with only 24 hours of instruction. This is the secret that has made Spanish Language Center the most successful Spanish school in Chicago! THERE'S NO CATCH! If you like what you read and decide to move forward to become a Spanish teacher, we will credit 100% of the $7 towards your full training. This promotional discount is only avialable for you for 24 hours. ACT NOW!